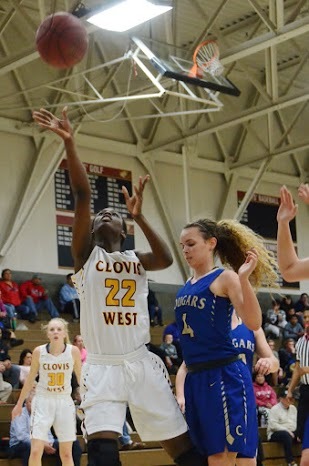 Clovis West senior Ashley Cross drives for a layup in the Golden Eagles 62-27 victory over Clovis and finish the TRAC with a perfect 10-0 record. The Golden Eagles are currently ranked No. 12 in the nation with an overall record of 26-3. Consider this most excellent seven-day stretch for the girls program at Clovis West: Coach Craig Campbell reached the 500 Win Club, they rose to No. 12 in the nation in the computer rankings of USA Today, they wrapped up their 11th straight TRAC title with a 10-0 record with their victory over Clovis and finally, they received the No. 1 seed in the D1 Central Section playoffs. It was a period to remember for sure, capped by a 62-27 thrashing of Clovis High on Feb. 17 on senior night. The Golden Eagles (26-3) weren’t challenged in the TRAC, outscoring opponents by an average of over 40 points this season led by the super juniors of Sarah Bates, Megan Anderson, Danae Marquez and Bre’yanna Sanders. Now for the stretch run, where a Valley Title and making noise in the state playoffs is on the menu. The secret to their success: they rarely have a player score in the twenties, team chemistry is preached, one player is never valued above the other, and oh, the girls genuinely like each other. In fact, just watch their pregame warm up routine and you’ll see why. 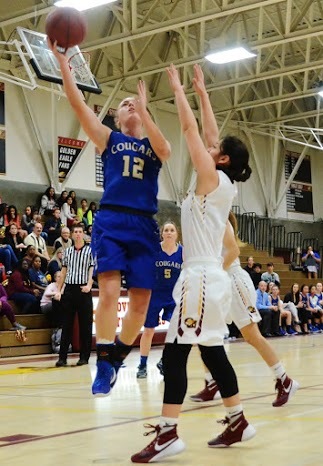 For example, against Clovis High, Anderson, the reigning State Sophomore of the Year, hit three high-arching three-pointers in the first half never to score again, Bre Sanders teammates found her under the basket for some easy hoops and Danae Marquez, the floor leader, scored 15 points, leading all scorers. And don’t forget that relentless defense they are known for. Clovis West’s Danae Marquez plays defense against Clovis’ guard Rachel Berry. Marquez scored 15 points in the contest, which led all scorers. Despite their lofty rankings and gaudy numbers the Golden Eagles are never satisfied, from game to game and possession to possession. In a nice gesture that honored Clovis West seniors Michele Cmarlo, Aysha Kirkland, Ashley Cross and Mia Gliatta, Coach Campbell started all four. After bolting to a 33-14 halftime lead that stretched to 41-17 after three quarters, the Golden Eagles simply were too much for the Cougars, wrapping up the perfect 10-0 record. In other words, the foundation and tradition are set before then, now it’s time to defend their back-to-back-to-back D1 titles.